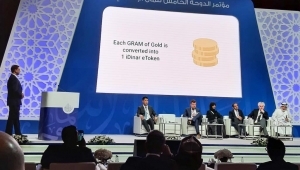 With the golden cover of the coin, “I-Dinar” is not only a symbol but a form of electronic gold portfolio. With the remarkable progress in the electronic exchange chain technology, i-Dinar can be used as a common denominator for executing and settling many financial transactions and exchange operations And trade. The spokesman for the Malaysian Cultivation Establishment Abbas Ali explained that the purpose of the platform was to facilitate and implement multi-product digital financial transactions that allow the trading of “i-dinar” with or for any other goods or products or coded currencies or any combination of solutions Financial instruments, as well as financial and commercial contracts from anywhere and at any time worldwide easily and conveniently. He said the new currency was a huge technological revolution in the world, being the first “mixed” digital exchange of its kind in the world, using a digital symbol supported by gold and has real value. The 5th Doha Islamic Finance Conference, held under the title “Islamic Finance and the Digital World”, was launched today. The conference aims at presenting the experiences of the central banks in dealing with digital financial developments and their potential risks. Legal and technical standards and the importance of the digital economy and its role in achieving sustainable development goals.